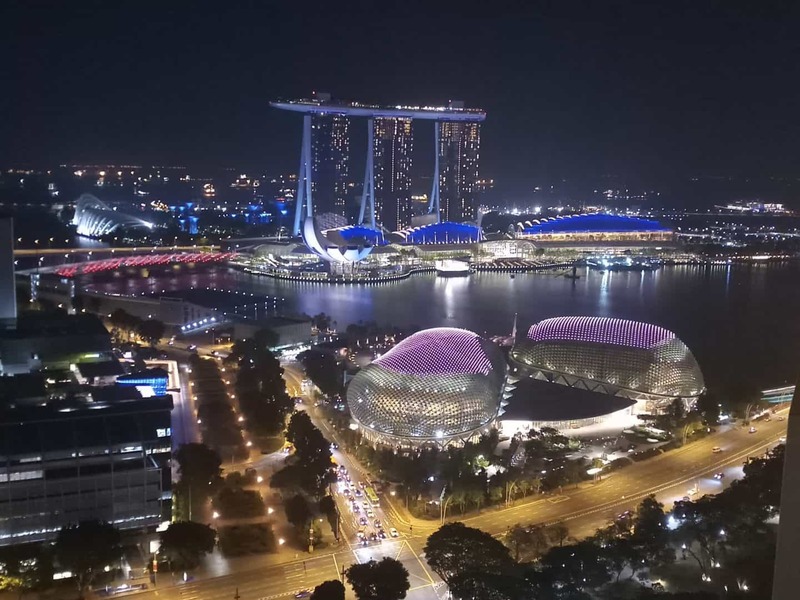 A budget travel itinerary for Singapore can come in handy if you are planning to visit Singapore, a perfect amalgamation of history, culture, adventure and entertainment. From stupendous architecture to incredible views, it has all that you may ask for. An international getaway in under INR 50,000 is what makes a budget trip to Singapore an extremely successful one. Singapore is considered to be one of the most culturally diverse countries in the world. Though, it’s not just the diversity of the city-state which is enchanting. 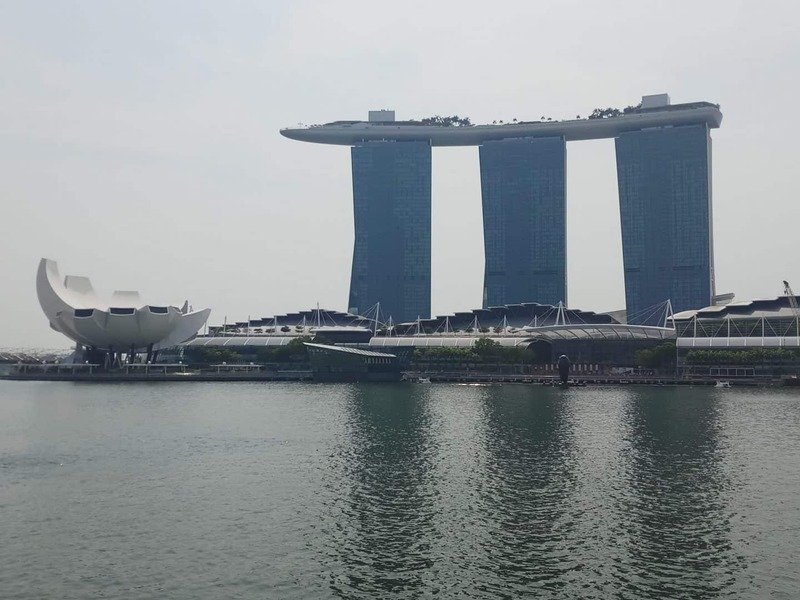 Modern architectural buildings and out-of-the-box attractions teamed up with top-notch facilities and the best-in-class hospitality wouldn’t disappoint anyone following a budget travel itinerary for Singapore. Exploring the city by one of the world’s best metro systems is an experience in itself. The island city of Singapore is a country in itself and the only one in the world to be such. The name Singapore was derived from a combination of two Malay words Singa and Pura which translates to the Lion City. The iconic Merlion – Singapore’s national symbol, was a structure built in the 1960s to do justice to its name. Located in South-east Asia, Singapore is ranked among the top 5 global cities of the world. Its location proves to be of critical importance promoting trade between the East and West. It is hence considered as Asia Pacific’s top business hub. Its strategic location also makes it a convenient destination for travellers to hop-in and out hassle-free. With numerous things to do, a budget travel itinerary for Singapore would be packed with highlights that one wouldn’t have even imagined. Singapore saw a massive transformation in the latter half of the 20th century. From a small fishing village, it went on to become one of the most advanced nations of the world. Today, Singapore is host to about 17.5 million tourists yearly, which is more than 3 times their current population! By air through any major city. Singapore is a very travel-friendly destination and reaching the place will not be much of a problem. Here are a few details you should know before you plan your Singapore visit. Singapore is located just one degree north of the equator, resulting in a hot and humid climate year-round. The best time to visit Singapore would hence be December – January, however, accommodation and flights would also be expensive owing to the holiday season. Avoid travelling to Singapore from April – June as the heat would be unbearable. The most convenient way to reach Singapore is to fly in. Singapore Airlines is voted as World’s Best Airlines and they truly deserve the title. It connects most major cities across the globe. Changi International Airport is the largest airport in Singapore, rated as the World’s Best Airport and is also one of the busiest in the world. All major airlines land at Changi Airport and connect Singapore to over 380 cities from almost a hundred countries. The other means of entering Singapore are by road from Malaysia, or by water through a cruise. Citizens from almost a hundred countries do not need a visa to enter Singapore. This list majorly includes countries from Europe, the Americas and Oceania. However, Indian nationals must apply for a visa prior to their arrival in Singapore. A Singapore tourist visa for Indian nationals can be obtained in less than a weeks’ time. Why should you plan a Budget Travel Itinerary for Singapore? Singapore developed from a third world country to a first world nation in a span of fewer than five decades. Tourism was and continues to be a major contributor to the development of the country economy. Singapore adds notable attractions every year which drives more and more people towards the country for short and long stays, over and over again. Eventually today, tourism contributes directly to the GDP of Singapore. Though the total area of Singapore is only around 750 sq. km., half the total area of Delhi – the national capital of India, the city-state will impress you with what it has to offer. This Singapore travel guide blog highlights the places that are unique and must not be skipped on your first visit to Singapore. The day-wise itinerary along with its approximate daily budget would help you plan your budget travel itinerary for Singapore without glitches. The list of things to do in Singapore is endless. From animal encounters in wildlife safaris to taking a stroll in the most impressive gardens, to pumping your adrenaline high with adventure activities; you name it and Singapore has it. Singapore might prove to be an expensive holiday destination for travellers, if not planned capably. A five-day budget travel itinerary for Singapore comes to the rescue for a perfect holiday. Here is a break-up of the expected expenses while planning a budget travel itinerary for Singapore. Since I was travelling from India, I have mentioned the approximate cost in Indian Rupees. Singapore is such a destination where you could enjoy a lavish and luxurious escapade or plan a trip on a shoestring budget. Either way, you’ll be able to experience the charm of the city-state that’ll make you want to go back to it over and over again. Are you wondering how to save money while travelling to Singapore? The key to minimizing Singapore expenses for travellers is to leverage their public transportation effectively. Singapore is extremely well-knit when it comes to public transport. The best way to travel around the city is through the MRT. The Singapore MRT stations are literally everywhere. Keep walking a couple of hundred metres, and you’ll stumble upon an MRT station on one of the lines. Servicing the entire city-state through five lines and over a hundred stations, the MRT sees a ridership of over three million passengers daily! To make things easier for travellers, the city offers what is called the Singapore Tourist Pass which offers unlimited rides on public transport – namely the MRT, LRT and buses. This pass is available for 1, 2 and 3 days. I would recommend that you buy the Singapore Tourist Pass for all the days that you are in the city. A budget trip to Singapore would be a traveller’s dream come true. This five-day budget travel itinerary for Singapore incorporates all the fascinating places worth a visit. Though, if you were to stay in the city-state for even a month, you wouldn’t get bored of exploring the place. Your arrival at the Changi Airport would in itself be more welcoming than ever. It is known to be one of the biggest airports in the world, and its grandeur wouldn’t let you believe that you’re at an airport. If your journey was tiresome, the vibe of the airport is going to help you overcome it. The first and foremost thing is to be comfortable in the city you’re going to explore. Spend the first half of the day getting a hang of the city. Check-in to your place of accommodation, know your surroundings and brace yourself for what’s going to be one hell of a trip. Head straight to Downtown Core in the afternoon to witness what it’s like to be surrounded by some of the most expensive buildings of the world. It forms the financial heart of the city, with the all the popular and noteworthy colonies, buildings and attractions. Take the MRT to Raffles Place on lines North-South (Red) or East-West (Green) to get there. Immerse yourself at Raffles Place where history and modernity unite, to understand what the city-state is all about. Take a stroll in the Merlion Park and capture the iconic picture beneath the water spouting from the mouth of half-lion half-fish Merlion. 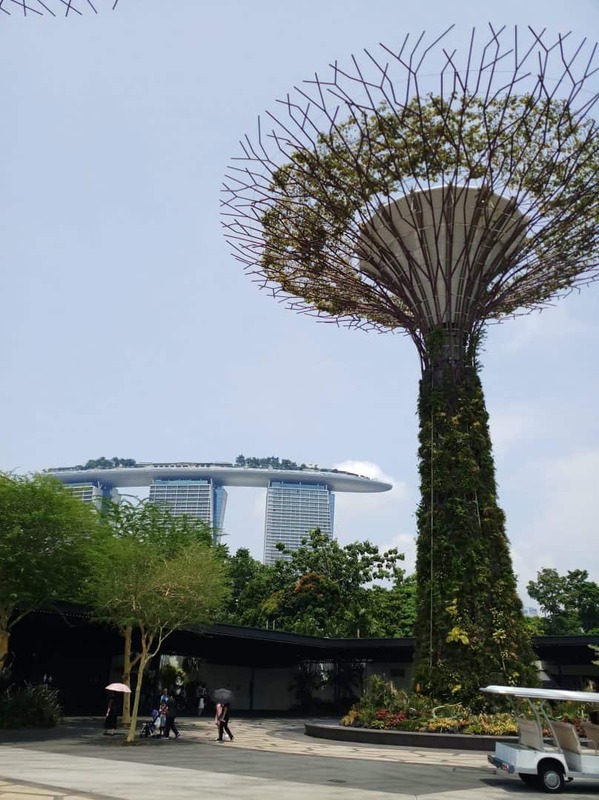 After spending some time at Raffles Place, walk to the Gardens by the Bay, one of the most breath-taking gardens Asia has ever seen. 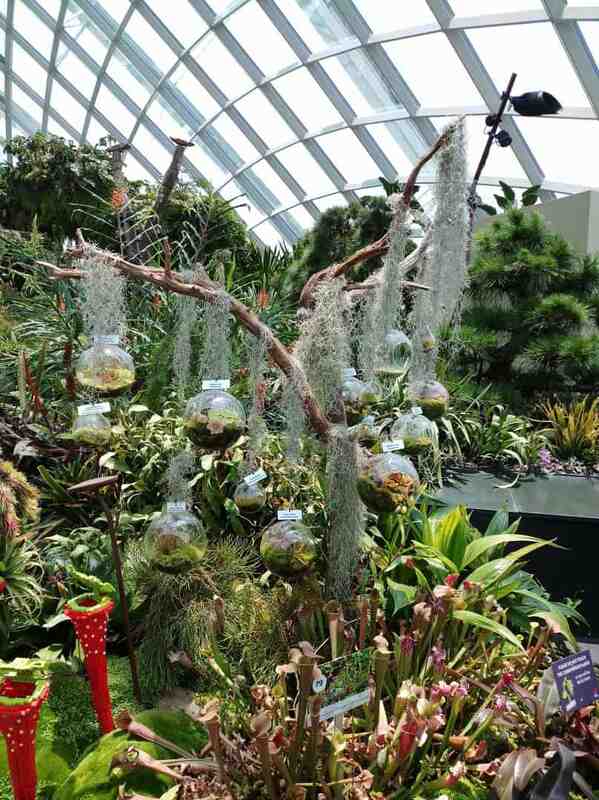 At Gardens by the Bay, your first evening in Singapore will be a one to remember. The largest of all, Bay South Gardens are home to a plethora of attractions. With art sculptures spanned across the gardens, they take pride in showcasing world-class garden artistry. They also exhibit tropical horticulture and host two cooled conservatories. Located in the Marina East across the Marina Barrage, Bay East Gardens offer the best view of the Singapore city skyline. Smallest of the three gardens, Bay Central Gardens links the other two gardens. It is known for its waterfront promenade, where you could enjoy your evening walk with scenic views. You must necessarily visit the Bay South Gardens, for all that it has to offer. Ensure that you witness the changing colours of the sky and the gardens during sunset. End your evening at the Gardens by the Bay with the Garden Rhapsody Light and Sound Show. It takes place twice every day- at 7:45 pm and 8:45 pm. You could seat yourselves near the Supertree Grove and be mesmerized by this symphony of sound and lights, at no cost! Wildlife Reserves Singapore will keep your adrenaline pumping with unique animal and bird species from around the globe. Four unique themed wildlife parks set you off to an adventure of a lifetime. Over 300 species and 2500 animals set in a rainforest, the Singapore Zoo is one of the top three zoos in the world. Over 5000 animals, including freshwater animals and pandas, the River Safari Asia’s only river themed wildlife park. A unique experience with walking trails and a tram safari with live commentary, Night Safari is world’s first nocturnal zoo. Over 400 species and 12000 birds, the Jurong Bird Park is the largest Asian bird sanctuary. As much as you’d like to cover all of the above in a single day, it is not possible to do so. It is recommended that you buy the ParkHopper Pass. This pass is valid for 7 days from your first visit and allows you one visit per park for all of the above. It also includes all boat and tram rides within the parks. Start the second day of your budget trip to Singapore as early as 8:00 am, as you’d be covering three of the four wildlife parks. Singapore Zoo, River Safari and Night Safari are located right next to each other. Hence you must plan to visit all of these in a single day. Take the North-South (Red) Line MRT to get down at Khatib station. You can then take the Mandai Khatib Shuttle to reach the parks. Spend about 4 hours at the Singapore Zoo in the morning and then proceed to River Safari post lunch. Do not miss the boat ride in the River Safari park which is included in your ParkHopper Pass. Another 4 hours in the afternoon at the River Safari would make it a good day. But best is yet to come – the Night Safari. The first slot is at 7:15 pm, which is ideal. Enjoy the tram ride or join the walking trails as you may like. End the day being amazed by the creatures of the night. Why wait to explore the last of the Wildlife Reserves after a day-long encounter with animals. Spend a colourful morning at the Jurong Bird Park with the rarest species of birds. Take the East-West (Green) Line MRT to Boon Lay and change to bus number 194 to the park. Jurong Bird Park opens at 8:30 am and it’s best to reach early to beat the crowd. The park has two bird shows – Kings of the Skies and High Flyers – that’d amaze you with the birds’ talent. Each show lasts for about 15 minutes. You should reach at least 15 minutes prior to the start time in order to get good seats. Bird feeding is a common activity in the park. Click some good snaps of birds landing on your shoulders for their feast. Depart from the park by around noon and take the East-West (Green) MRT to Bugis. Now is the time for some street shopping. Though Singapore is not as cheap as shopping in other South-east Asian cities like Bangkok, it does offer quality stuff up for grabs at decent prices. Bugis Street hosts stalls with some of the best bags, clothing and footwear at competitive rates. After you’ve burnt a hole in your pocket, take the North-East (Purple) MRT line from Bugis Street to Chinatown to explore the rich Chinese culture. Chinatown is a delight for shopaholics with the best bargains on clothing, souvenirs and much more. The area also offers some of the best street food you can find in Singapore. End your day at Clarke Quay, just steps away from Chinatown. It is the perfect place to experience the nightlife of Singapore by the Singapore river when the sun goes down. From the upmarket fine dine restaurants to the pumping party clubs, Clarke Quay has it all. Sentosa, meaning tranquillity in Malay, is an island resort located off the southern coast of Singapore. An entire day packed with exhilarating activities is in store for you at Sentosa island. The world-famous Universal Studios is a major highlight at the island. Apart from that, several other activities will keep you busy all day long. Instead of purchasing tickets for every attraction, it is recommended that you buy the Sentosa Fun Pass. It lets you chose the activities that you’d want to spend your time on. Pre-purchasing the pass online has a cost benefit as well. You can enter the island by road, rail, on foot or fly in (literally, through the cable car). The fastest and cheapest means to reach the island is to walk in. Take the North-East (Purple) or Circle (Yellow) MRT line to Harbourfront. The Sentosa Boardwalk starts at the Vivocity mall. An entry of S$1 is charged to enter the island. The boardwalk allows you a glimpse of the island from afar. In less than 10 minutes and 700 metres, you’ve arrived at the Sentosa island. Universal Studios tops the list of attractions that you must visit while in Singapore. Brace yourself for an action-packed day with roller coaster rides, movie-themed attractions and shows. One can easily spend half a day here. A one-day adult pass to the Universal Studios Singapore costs S$76. Sentosa island also offers multiple adventure activities like iFly, Megabounce, Climb Max, Adventure Cove Waterpark, and more. If you wish to incorporate all of the activities listed above in your budget travel itinerary for Singapore, just a day in Sentosa would not be enough. You must split your visit to Sentosa island into two days, covering Universal Studios on one day and enjoying rest of the activities on the island on the second day. The last day of the budget travel itinerary for Singapore should be spent exploring the popular attractions of the city. Start your day at the Esplanade, marvelling what a wonderful piece of architecture it is. A trip to Singapore is incomplete without taking a sneak peek at it from its waterways. River cruises in the Singapore river will allow one to view the city differently. The Singapore River Cruise is also known as ‘A Tale of Two Quays’ and covers Boat Quay, Clark Quay and Marina Bay. The 40-minute boat ride with live commentary is a delightful experience. It starts at multiple points, and you may board and disembark the cruise at the Esplanade Jetty. Post the river cruise experience, you can walk down to the Singapore Flyer. In operation for over 10 years now, it is Asia’s largest observation wheel standing tall at 165 metres. A round in the flyer takes about 40 minutes and treats you with 360-degree city views. 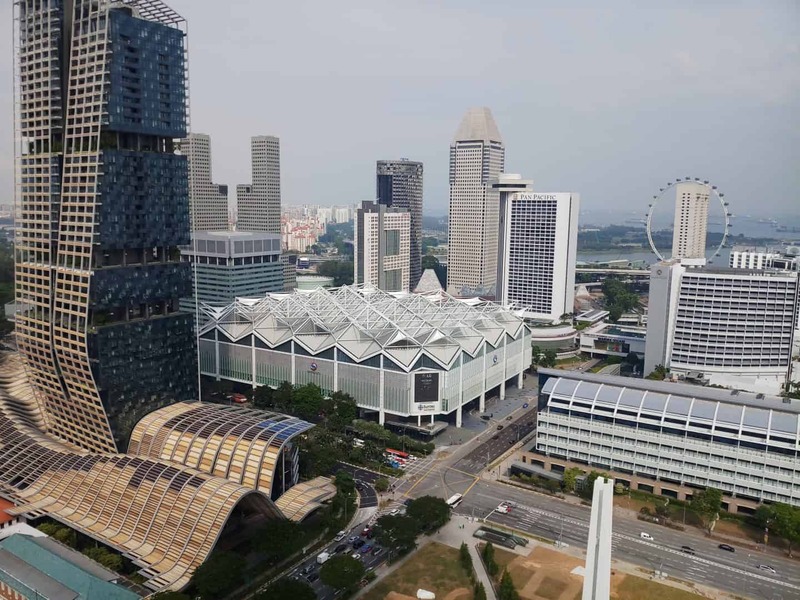 To top it all, you get a bird’s eye view of the Marina Bay Street Circuit – the F1 car racing track. Walk across the Helix Bridge, another wonderful piece of architecture, also known to be the world’s first curved bridge. It is a pedestrian’s bridge across the Singapore river linking Marina South to Marina Centre in the Marina Bay area. Once across the Helix Bridge, you would reach Marina Bay Sands, the iconic hotel that boasts of the world’s largest rooftop infinity pool. The Shoppes at Marina Bay Sands hosts the largest collection of luxury brands in South-east Asia. Window shopping at The Shoppes is the only affordable option while on a budget trip to Singapore. The last attraction for the day is the Marina Bay Sands Skypark Observation Deck located on the 57th floor. You can view the sunset from atop the Skypark with mesmerising views of Downtown core and Gardens by the Bay. Also plan to visit the banana-split shaped Art and Science Museum, right at the foot of Marina Bay Sands. What’s better than having a list of things to do absolutely free in Singapore! Here is a list for your reference, with the nearest MRT station to make things easier for you. All checks on this list and you’d have certainly minimized your Singapore travel cost. It is absolutely essential for any trip, especially an international one, that you start planning well in advance. Here are a few tips to save money in Singapore by planning the trip efficiently, before you land in Singapore. These insights would minimize Singapore expenses for tourists by at least three hundred Singapore dollars, if not more. If you’ve visited Universal Studios in the USA or are planning a trip there in the near future, you may exempt it from your budget travel itinerary for Singapore. You’ll save half a day and about a hundred dollars by skipping it. However, if the Universal Studios in the USA is not on your bucket list, this one is a must visit. To visit the four wildlife themed parks by the Wildlife Reserves Singapore, buy ParkHopper Pass online beforehand, to save an addition 5% on the ticket price. If you are not an animal lover and wouldn’t want to spend a lot of time in the wildlife parks, you may pick the 2 Park Admission ticket and save almost 30% of the ticket cost. The Singapore Flyer and Sands Skypark Observation deck are just a few hundred metres apart and provide similar city views. 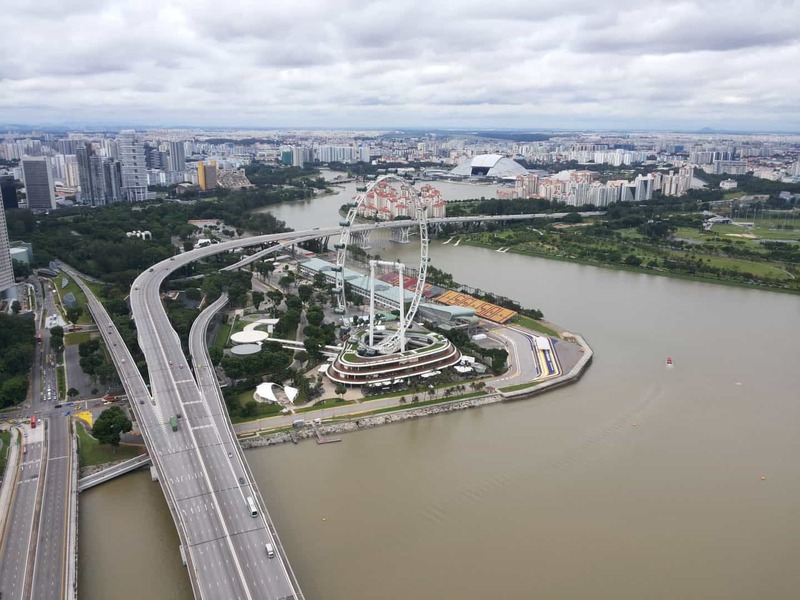 You may skip your visit to the Singapore Flyer as the ticket costs S$10 more than the Sands Skypark. Also, Marina Bay Sands is over 40 metres taller than the Singapore Flyer, hence you wouldn’t miss out on much. Sentosa Fun Pass offers three options – Play 3, Play 5 and Play Max which allows you entry to any 3, 5 or all attractions respectively, based on your pick. Buying the Sentosa Fun Pass Play 5 in advance lets you save almost 40% of the ticket cost if you’re spending half a day on the attractions. The Singapore Tourist Pass for three days, worth S$20, is the most economical way to get around the city. You can buy it at any major MRT station and at the airport as soon as you land. You will be entitled to unlimited access to all public transport. What more can you ask for! Street food in is available in plenty in Singapore. The influence of varied cultures on the city-state only broadens your choice for trying out different cuisines. Areas like Little India, Kampong Glam and Chinatown are brimming with inexpensive food joins to keep your Singapore travel cost minimal. Singapore is an expensive city to stay in. On a budget travel itinerary for Singapore, it is recommended that you pick a hostel or a homestay. The Bohemian in Chinatown is a good pick, offering clean beds in dormitories at decent prices. Moreover, it is a safe place to stay and the nearest metro station is just a two-minute walk. A budget travel itinerary for Singapore lets one look at the many colours of the city through different lenses. People from across the globe have had Singapore take their heart. The diversity in ethnicity, religion and culture make a trip to Singapore an immersive experience. It’s not for no reason that Singapore is one of the best and most visited cities in the world. Aren’t you excited about planning this trip already? Shreya Doshi is a Mumbaikar at heart but her soul takes her globe trotting. She has traveled over a hundred cities, from bustling metropolitans to quaint countryside towns. However it’s at the beaches that she finds true solace. 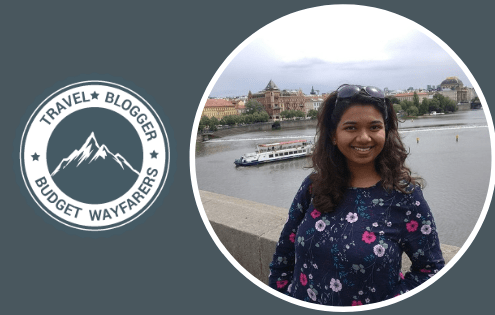 Shreya holds an entrepreneurial spirit and aims to be a travel counselor some-day. She strongly believes in travel therapy and that solo-travel is the best teacher. 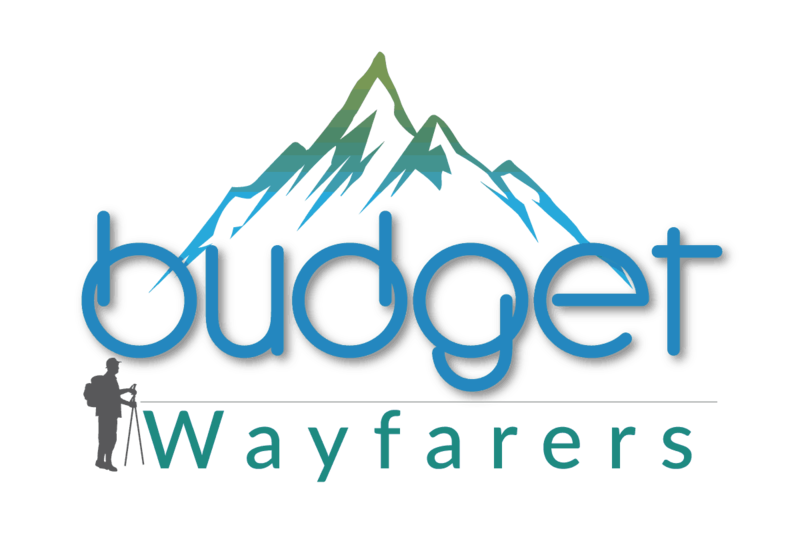 THIS POST ENTITLED, ‘TRAVELING TO SINGAPORE ON A BUDGET: THE COMPLETE ITINERARY’ IS AN EXCLUSIVE PROPERTY OF BUDGET WAYFARERS. ANY INDIVIDUAL OR ASSOCIATION INDULGING IN PLAGIARISM WILL BE DEALT WITH STRICTLY. IF YOU WANT TO USE INFORMATION FROM THE ARTICLE ABOVE, KINDLY QUOTE THE SOURCE. Backpacking to Japan Solo: Complete Itinerary & Budget Tips for First Time... 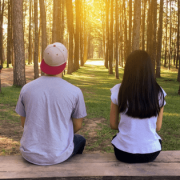 Permits for Arunachal Pradesh – How to Obtain Them?